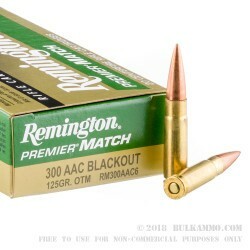 While the .300 AAC Blackout did originate from earlier versions (remember the .300 Whisper), it was Remington that took on the challenge of SAAMI specifications and marketing the round that has become a bit of an industry darling of late. 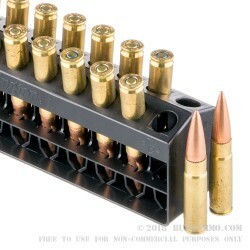 This is their first, and continuously on market version of the match ammunition for that cartridge platform. It has been the stalwart for those who want to achieve legitimate accuracy out of a fac5ory load without paying ridiculous prices, and without having to rely on handloading. A supersonic round, this is not your typical suppressor specific cartridge, but it does give you a chance to test out the full ballistics of the .300AAC Blackout. With the type of accuracy at reasonable ranges that this load can offer, it gives a whole new level of versatility to the already very interesting caliber. 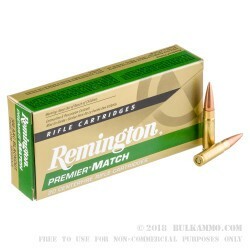 The open tip match point bullet is suitable for hunting big game and this is an ideal cartridge for deer at up to 250 yards (supersonic) and out to 80-110 yards or so (subsonic – note this ammunition is NOT subsonic). This cartridge pushes 2210 feet per second at the barrel and 1350 ft. lbs. of energy, making it a substantial round without too much more than is needed for sort and intermediate distances on targets of large game or smaller (though for extremely large game you may look for more potent calibers). Q: what does OTM stand for? A: Hello Jake! 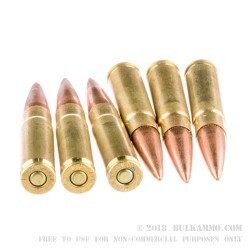 OTM stands for Open Tip Match, and is a reference to the design of the bullet.